Educated as an architect, the Swiss photographer Georg Aerni (*1959) naturally gravitated toward subjects of architecture, urban space, and the design of landscapes in his art. An extraordinary care and attention to craft is inherent in all of his body of work, which includes architectural photography taken in Paris, Barcelona, Hong Kong, Tokyo, and most recently Mumbai, as well as recent series in the Alps and various European zoos. With precision and subtle colorfulness, Aerni’s images allow the viewer to understand a city or landscape as a space of signs, which, although deserted, reveal a great deal about social conditions and our time. His photographs find those signs that characterize the mood of both urban structures and landscapes—a mood that is created by humans. 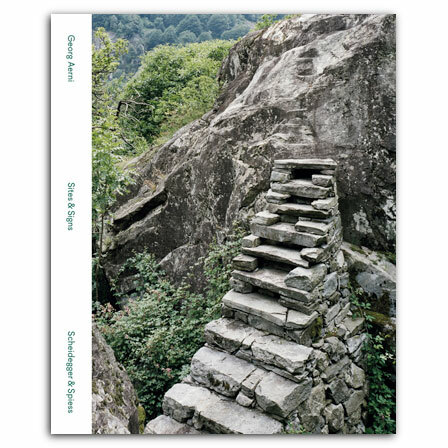 Sites & Signs is the first comprehensive monograph on Georg Aerni’s work. Included alongside the photos are essays by Stephan Berg, Moritz Küng, and Nadine Olonetzky that consider Aerni’s work in the context of contemporary photography, and on images of architecture and landscapes. Documenting one of the most interesting positions in contemporary Swiss artistic and architectural photography, Sites & Signs will provoke a captivating dialogue between photographers, urban planners, and architects. Sites & Signs won a silver medal in the 2012 German Photo Book Award. , born 1962 in Zürich, freelance cultural publicist and editor with Scheidegger & Spiess publishers. Contributes regularly to NZZ am Sonntag and to books and catalogues on photography, art, and art history. Member of Kontrast (kontrast.ch) in Zürich.